The question is how much of the turmoil we own—and how we’re going to make good on our moral debts. A little girl from Honduras stares into the camera, her young features contorted in anguish. She’s barefoot, dusty, and clad only in a diaper and T-shirt. And she’s just had to run from clouds of choking tear gas fired across the border by U.S. agents. A second photograph, which also circulated widely and rapidly on social media, shows an equally anguished woman frantically trying to drag the same child and a second toddler away from the gas as it spreads. 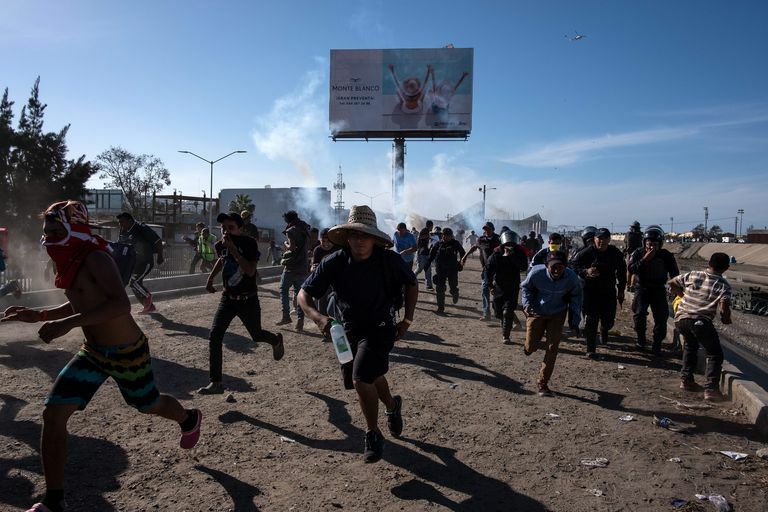 The three were part of a much larger group, perhaps 70 or 80 men, women and children, pictured in a wider-angle photo fleeing the tear gas. 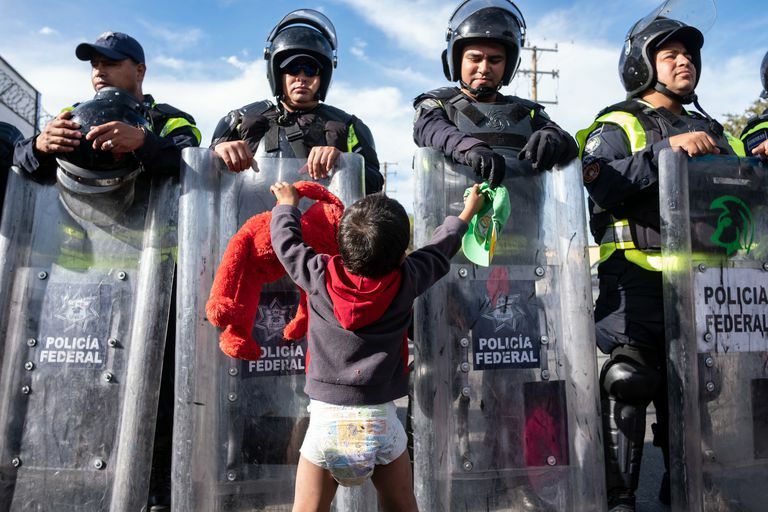 Reuters photographer Kim Kyung-Hoon shot the images, which provoked outrage and seemed at odds with President Trump’s portrayal of the caravan migrants as “criminals” and “gang members.” Trump officials said that authorities had to respond with force after hundreds of migrants rushed the border near Tijuana on Sunday, some of them throwing “projectiles” at Customs and Border Protection personnel. Before we get into this latest atrocity committed in our name, let’s go back to October 23, 1998. On that date, the CIA declassified the report by its inspector general regarding what the CIA was doing in Honduras as part of the general (and bloody) Reagan Administration meddling in Central America in the previous decade. Thanks to the irreplaceable National Security Archive, we learned that the Honduran military was freed up to make war on its own people so that the United States could keep using the country as a staging area for its adventurism elsewhere in the region. 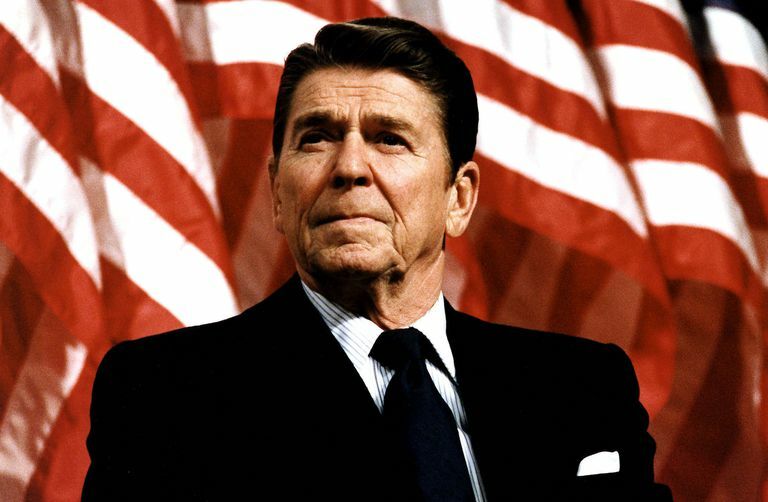 The report indicates that the CIA knew contemporaneously about the abuses which were occurring, and did not report on them as it should have even though Honduras was the linchpin of U.S. Central America policy during the Reagan administration. Despite CIA knowledge of Honduran military abuses, more than $1 billion in U.S. taxpayers money flowed to the Honduran military throughout the 1980s. “The CIA knew there was blood on the hands of the Honduran military but covered it up, providing impunity for rights abusers and misleading the U.S. Congress and public,” noted National Security Archive Research Fellow Susan Peacock. She called the release of the IG report “a step toward the disclosure which President Clinton promised vis-a-vis human rights abuses in Latin America.” Despite the Clinton Administration’s commitment to Congress to release the report to the fullest extent possible, major portions — including critical sections on CIA involvement in “torture or hostile interrogations” and “possible accountability issues” — are blacked out. As the years went by, the United States couldn’t quit Honduras. And it was very much a bipartisan bit of business. In 2009, when a military coup deposed President Manuel Zelaya at the insistence of the country’s Supreme Court, then-Secretary of State Hillary Rodham Clinton supported the government that was installed by the coup. While Clinton was running for president, she argued, especially to Democracy Now‘s Juan Gonzalez, that the coup was at least nominally constitutional, and that supporting the deposing of Zelaya was the least-bad option. 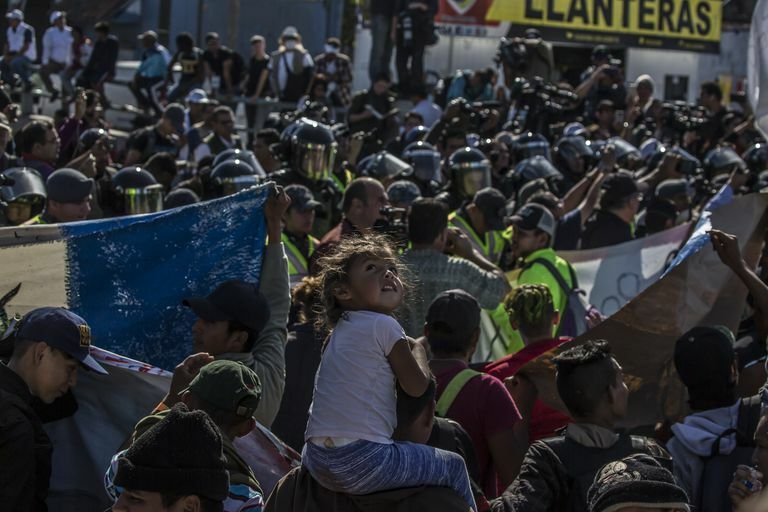 That remains debatable, but what does not remain debatable is that Honduras subsequently descended into the present chaos. Lawyers and human rights defenders suffer threats, attacks, and killings. In 2016, CONADEH registered 16 violent attacks against lawyers, including 13 killings. The IACHR described Honduras in August 2016 as one of the “most hostile and dangerous countries for human rights defenders” in the Americas. To date, eight men have been charged with the murder in March 2016 of environmental and indigenous rights activist Berta Cáceres, including an army major and the former environment manager of Desarrollo Energético S.A. (DESA), the company behind the Agua Zarca dam project that Cáceres was campaigning against at the time of her death. The Mechanism for the Protection of Journalists, Human Rights Defenders and Operators of Justice, created in 2015, suffered from a lack of adequate resources and staffing, according to local activists. Under a scheme to strengthen Central America launched in 2014 known as the Plan of the Alliance for Prosperity in the Northern Triangle, the United States pledged to put forward a dollar for every four invested by Honduras, Hernandez said. But that commitment has not materialized, he added. “That will obviously have repercussions,” he told Reuters. 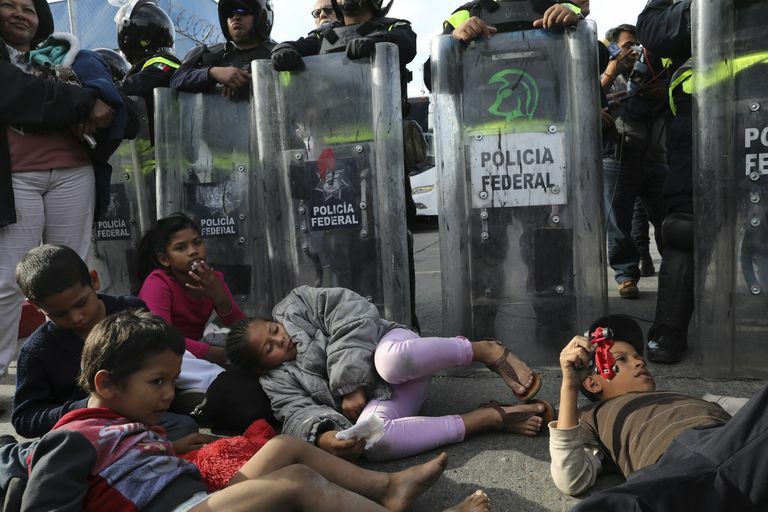 “Because the whole idea of the Alliance for Prosperity … was to attack the migration problem at the root.” Between 2016 and 2018, combined U.S. foreign aid for Honduras, Guatemala and El Salvador declined by more than one third to $195 million, according to official U.S. data. The people at the border literally are running for their lives. The idea that the United States is now actively hostile to asylum seekers is a nasty throwback to the 1930s. And there we are. The problem was that not enough people in America cared enough to understand why those Jews were fleeing, and from what they were fleeing in the first place. That is still the problem today. Radical Trumpists already are calling the weekend’s violence a successful repelling of a horde of “invaders,” as though gassing shoeless toddlers was the equivalent of Charles Martel’s turning back the forces of the caliphate at Tours. That point of view will be taken immediately as the legitimate Other Side of the argument regarding using chemical weapons on impoverished children. These are people being told through violence that they have to return to the violence that drove them out of their countries in the first place. The ones with longer memories will recall the days when the United States used Honduras to initiate violence in Guatemala and El Salvador for the purpose of initiating it in Nicaragua. The younger ones will simply hate us. The Imperial Prerogative comes with some very heavy dues. Charles P. Pierce has been a working journalist since 1976. 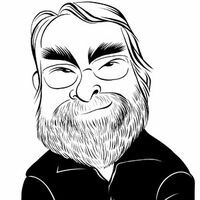 He is the author of four books, most recently ‘Idiot America.’ He lives near Boston with his wife but no longer his three children.